And now you have to get rid of half your cards. Your plan is completely ruined and to top it off, next you roll a 4 and get sheep instead of wheat. And who in the world needs sheep?!? If you know me at all, you know I’m talking about Settlers of Catan. Only one of the greatest board games of all time. And if you’ve ever played, you know exactly what I’m talking about. The game of Catan constantly changes. You’re trying to build roads, then someone cuts you off. You’re trying to get rock, but you only get wood. You want to buy a city but can only afford settlements. And after years of playing, I’ve discovered what sets the winners apart from the losers. It’s one single word. The people who can consistently win at Catan are the ones who are able to change their strategy and pivot to something new. Winners react to changes in the game faster than everyone else. In Catan, you’re constantly dealt new cards based on the roll of the die. Every single turn you could get something different. And those new cards may help you do what you wanted, or they may help you do something else. The key is to pay attention to what that something else might be and not get so focused on what you originally wanted. If you want to lose quickly, then just stick to pursuing one strategy. A lot of people plan on building a city. And they just go, and go, and go towards building that city. They put blinders up and just go straight for that one thing, regardless of whether or not it makes sense three turns later. In contrast, the best players pay attention to all of their surroundings and then change their plans accordingly. 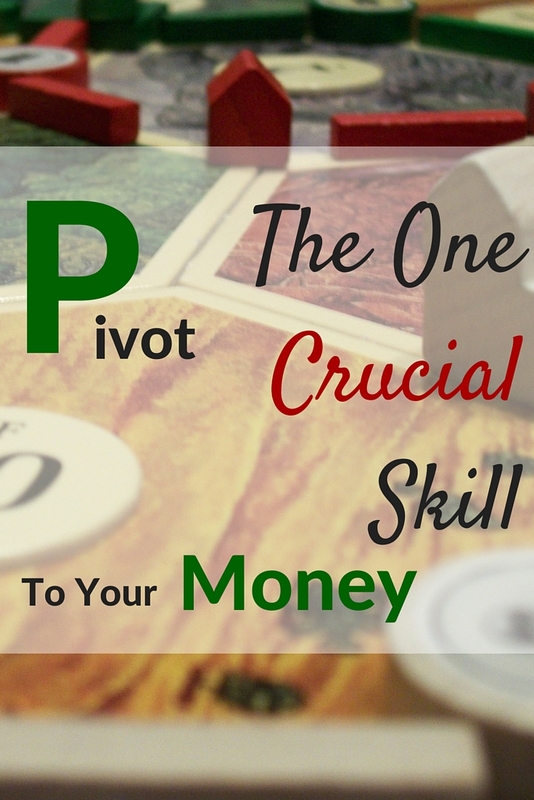 Being able to pivot is crucial to winning board games. But that isn’t the only place it’s important. Learning to pivot is also crucial if you want to find financial freedom. This timeless phrase rings true more than ever when talking about the importance of pivoting. You never know when you’re going to have an emergency. A broken down car, a water pipe burst, unexpected school cost, speeding ticket, birthday party, funeral expense, bridesmaid dress, an unexpected pregnancy, or a lost job. And it’s not always negative. Sometimes you get a large tax refund, an unexpected inheritance, extra scholarship money, or an unforeseen job promotion. Other times it’s not even directly tied to money. Maybe your wants/needs change, you decide you’re tired of living in a certain area, no longer like your job, want to move out of the city, or want to go on vacation. All sorts of things happen every single day that can change your situation. The problem is most of us either get stuck on the same ideas when a change happens, or we’re just not paying enough attention to even notice a change. The first step to learning how to pivot is to accept that life is unexpected. If you want to find financial freedom, you’re going to have to learn to change plans. You’ve got to be okay with course correcting and changing directions. Sometimes it’s going to feel like you’ve been heading one way, only to now head another. Pivoting is hard because we have cognitive biases that get in our way. We hold ourselves back from changing plans because we’ve already invested so much time and energy into Plan A. And what’s even worse, is that after changing plans a few times, we get discouraged and most of us eventually just give up. We stop trying to course correct and just let life happen to us, instead of happening to life. The thing about pivoting is that we have to accept that our plans don’t always work exactly how we want. We don’t get into the school we want. We don’t land the job we want. We aren’t able to purchase a house in the area we want. But rather than beating our heads against a shut door, we need to turn slightly and look for other doors. There’s always another option, we’ve just got to find it. Pay attention to what changes. If you’re budgeting, try to pay attention to what’s working and what isn’t. If you’re tracking expenses, pay attention to patterns that change. Pay attention to your own wants and desires and/or families wants and desires. Pay attention to what’s different. You need to become Jason Bourne and notice all of your surroundings. Jason Bourne is the ultimate “payer of attention”. He notices all of the details and makes plans accordingly. In the same way, if you want to be able to pivot based on what changes, you’ve first got to notice the changes. So when it comes to money, you’ve got to have a sense of where you are. Do you know what your net worth is? Do you know how much money you make each month and how much money you spend each month? This is why tracking your money is so important. If you have a goal of saving for that cross-country road trip, you’ve got to know when things change so that you can pivot and get back on track. If you don’t track expenses, you’ll never know, and you’ll never be able to go on the trip. Paying attention isn’t enough. When you see a change, you need to make a reaction plan. When you have an emergency make a plan for how you will pay for it. When you get some unexpected money, make a plan for how you can use it. Whenever these changes occur, always fall back to your overall goals, wants, needs, and desires. See how you can use the current changes to your advantage to get there. Sometimes in Catan, the unexpected happens like someone blocking your income source. Instead of giving up and hoping that the dice will favor you next time, you’ve got to pivot and try something different. In Catan, that normally means figuring out a way to trade with others to meet your goals. There’s always a way, you’ve just got to plan and find it. After you’ve made your plan it’s time to follow through on it and then evaluate the results. A plan is nothing if there’s no follow-through. You can have the greatest plan in the world, but if you don’t execute, it doesn’t matter. But always come full circle and continually evaluate. Like I talked about at the beginning, be okay with knowing that it won’t always work out. When you start looking at your actions, you’ll probably have to pivot again at some point to get back on track, and that’s okay. Life is a series of unpredictable events and our job is to do our best with the cards we’ve been dealt. When something changes, whether it’s income, expenses, wants, or needs, ask one question. What do I do now that will move me towards my goals? That’s how you pivot. You have an open mind to changing paths but still focus on the long term goal. In Catan, the long-term goal is to gain 10 victory points. It doesn’t matter how you get there, it just matters that you get there. It’s the same with financial freedom. Figure out what being financially free means for you and don’t be afraid to change strategies along the way. It’s natural and even necessary to learn the pivot.